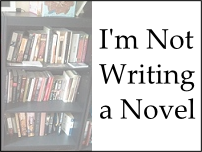 I am not writing a novel. I have attended no writing workshops. I have never pursued writing as a profession, and could hardly be accused of writing as a hobby, either. I’m just a blogger, and even that’s debatable. Well, not any more. At this point I can’t deny that I’m a blogger. I have the bug and am very much enjoying the writing communities I’ve joined, as well as getting that thrill that people might actually want to read something I’ve written about parenting, music, or whatever other random thought comes into my head when sleepless at night. Who am I? I am a woman. I am a daughter, a grand-daughter, a mom and a wife. I was both a geek and a nerd, but my membership cards got revoked at some point (I think it was when I bought a pre-packaged computer instead of building my own; I seem to remember receiving a scathing excommunication via the interwebs). In my professional life I do clinical informatics. If you want to look it up and get an idea of details, go Google “HL7”. I am a singer. I am a dancer. Until somewhat recently I moonlighted (Moonlit? I like moonlit better. Correct? Who cares.) moonlit as a swing dance instructor, but am currently on hiatus. If you’d like to see what I and my family look like, check out my Peek-A-Boo page. Despite my flippancy above about “moonlit” I am a fan of grammar, spelling, and for that matter, phonics. However, I am imperfect and I’m ok with that. Strunk and White live in my head, but I have conveniently edited them in my memory to suit my own preferences. And, lest my first paragraph be misinterpreted, I am in gobsmacked awe of those who actually are writing novels, articles, blogs; those who have allowed writing to be alive in their hearts and minds, those who do it quietly, those who do it to great acclaim. So, yes, I am a total stranger, and can’t wait to read your posts. I am actually in awe of ANYONE that can put their thoughts into “paper words” without sounding like an idiot – something I am striving to do even at the ripe old age of 52.